After the Patriots came out on top in the Deflategate ruling last week, Roger Goodell and his minions have retaliated by resurrecting the corpse of Spygate and bringing to light "new" cheating allegations that span Bill Belichick's tenure as head coach in New England. First with ESPN and the information that is in fact new in detail, the Worldwide Leader (somehow, someway!) unearthed information as to how Spygate unfolded. According to ESPN, from 2000 to 2007, the Patriots videotaped the signals of opposing coaches in 40 games, with the tapes being stored away in a room in Gillette Stadium. 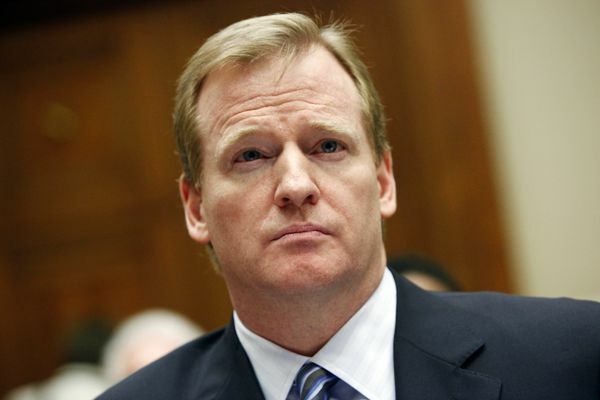 After Goodell levied the punishments against the team in September 2007, and after Matt Estrella's tape of him recording the New York Jets from Week 1 was leaked via Jay Glazer of Fox Sports, the public outcry against the Patriots multiplied, and Goodell (as he's always operated) bent to the public and opted to investigate further. The NFL sent three officials, lead by non other than league general counsel Jeff Pash (you know, the guy who edited the Wells Report and then was barred by the NFL from testifying in the appeal hearing?) to Gillette on September 18. The three of them, get this, "stomped the videotapes into small pieces and fed [Ernie] Adams' notes into a shredder." Three league officials...in their suits and shoes...smashed 40 VCR tapes into tiny pieces a la the guys from Office Space smashing the printer to bits out in the open field. ESPN also reported that Goodell's overreaction and overzealous approach to Deflategate was a result of owners around the league pressuring him to do so as they felt he let the Patriots off too easy on Spygate. What else are the Patriots accused of doing with no proof attached behind it? Patriots staffers would sneak into the opposing team's dressing room and steal the script for the first 20 or so offensive plays. Patriots staffers would pillage opposing teams' hotel rooms looking for materials related to game plans. The radio communication between opposing coaches and quarterbacks would cut out in key game situations at Gillette Stadium. The rest of ESPN's report points to allegations without proof, claims with no backing and assertions that fall flat on evidence. As for Sports Illustrated, they reported that "multiple teams" informed the Seattle Seahawks to beef up security through Super Bowl week back in January, with the message being clear: "You're not playing John Fox’s Broncos again. You’re facing Bill Belichick and the Patriots. You never know who might be watching." ...hired extra guards and scanned any area nearby with a vantage point of the field. Security personnel monitored what locals call “A” Mountain, the 1,400-foot hill that towers above the university’s athletic complex. They combed the parking garage and parking lots between Sun Devil Stadium and the practice fields. And they checked around the boundary of the complex, where baseball and softball fields and various buildings provided clear views of Seattle’s Super Bowl drills. Several observers who have attended practices for other Super Bowls noted the unusual, Secret Service–like level of activity. And to no one's surprise, nothing was found. Zip, zlich, nada. SI continued by rehashing old quotes from the likes of Bart Scott, anonymous former team staffers, and even touching on the OG boogeyman himself, Ernie Adams. The SI report does point out that Belichick and the Patriots have a better winning percentage (.781) post-Spygate than before (.670), but the credit is immediately followed by two paragraphs covering the team's "aversion to fumbles" over the last 10 years. You know, the belief that Deflategate shows that the Patriots have been deflating footballs since 2006 because they've fumbled less than all but one other team in the NFL. In the end, the fact remains that everything the Patriots do is an obsession among other teams. You think the Patriots are the only team to ever go back into a hotel room and scan the area for play sheets left behind? The first to swipe a play sheet whenever they get the chance? The first and only team to record other team's signals? No, no and no. To borrow and modify a line from a certain former local newspaper deliveryman, Bill Belichick owns so much real estate between the ears of other teams that he's a licensed property proprietor.